2010-08-20 Assigned to COOPERVISION INTERNATIONAL HOLDING COMPANY, LP reassignment COOPERVISION INTERNATIONAL HOLDING COMPANY, LP ASSIGNMENT OF ASSIGNORS INTEREST (SEE DOCUMENT FOR DETAILS). Assignors: COOPERVISION, INC.
2010-12-20 Assigned to COOPERVISION INTERNATIONAL HOLDING COMPANY LP reassignment COOPERVISION INTERNATIONAL HOLDING COMPANY LP ASSIGNMENT OF ASSIGNORS INTEREST (SEE DOCUMENT FOR DETAILS). Assignors: ASAHIKASEI AIME CO. LTD.
Ophthalmically compatible contact lenses include lens bodies configured for placement on a cornea of an animal or human eye. The lens bodies are made of a hydrophilic silicon-containing polymeric material. The lens bodies have oxygen permeabilities, water content, surface wettabilities, flexibilities, and/or designs to be worn by a lens wearer even during sleep. The present lenses can be worn on a daily basis, including overnight, or can be worn for several days, such as about thirty days, without requiring removal or cleaning. This application claims the benefit of U.S. Provisional Application No. 60/604,961, filed Aug. 27, 2004 and U.S. Provisional Application No. 60/621,525, filed Oct. 22, 2004, the contents of which in their entireties are hereby incorporated by reference. The present invention relates to contact lenses which are wearable, on a continuous basis, for extended periods of time. In particular, the invention relates to flexible, hydrophilic silicon-containing contact lenses which have advantageous combinations of properties. Contact lenses are fundamentally classified into soft and hard type lenses. Hard contact lenses are literally hard and can be somewhat uncomfortable to wear. On the other hand, soft contact lenses are more comfortable to wear, but are commonly removed from the eye at the end of each day. Soft contact lenses are classified as hydrogel lenses and non-hydrogel lenses. Conventional soft hydrogel contact lenses are often composed of copolymers of hydrophilic monomers, such as hydroxyethylmethacrylate, N-vinylpyrrolidone and the like, and can be prepared by lathe-cutting methods, spin casting methods, cast molding methods or combinations thereof, followed by a swelling treatment in a physiological saline and/or phosphate buffer solution to obtain lenses with water contents of about 20% or about 30% to about 80% by weight. Soft silicon or silicone hydrogel contact lenses have been suggested for continuous wear for extended periods of time. For example, some silicone hydrogel contact lenses are intended to be worn overnight. Some silicone hydrogel contact lenses can be worn continuously for about two weeks, and some silicone hydrogel contact lenses can be worn continuously for about one month or about thirty days. Such continuous wear lenses have had relatively high oxygen permeabilities to provide for oxygen access to the cornea during the extended wearing of such lenses. Oxygen permeability (Dk) is an important factor in contact lens design to maintain ocular health for contact lens wearers. As established by Holden and Mertz in 1984, a minimum of 87×10−9 (cm ml O2)/(sec ml mmHg) oxygen transmissibility is required for hydrogel contact lenses to limit overnight edema to 4% (Holden et al., Invest. Ophtalmol. Vis. Sci., 25:1161-1167(1984)). Physical properties such as oxygen flux (j), oxygen permeability (Dk), and oxygen transmissibility (Dk/t) are used in referring to properties of contact lenses. Oxygen flux can be defined as a volume of oxygen passing through a specified area of a contact lens over a set amount of time. The physical units of oxygen flux can be described as μl O2 (cm2 sec). Oxygen permeability can be defined as the amount of oxygen passing through a contact lens material over a set amount of time and pressure difference. Physical units of oxygen permeability can be described as 1 Barrer or 10−11 (cm3 O2 cm)/(cm3 sec mmHg). Oxygen transmissibility can be defined as the amount of oxygen passing through a contact lens of specified thickness over a set amount of time and pressure difference. The physical units of oxygen transmissibility can be defined as 10−9 (cm ml O2)/(ml sec mmHg). Oxygen transmissibility relates to a lens type with a particular thickness. Oxygen permeability is a material specific property that can be calculated from lens oxygen transmissibility. Oxygen transmissibility is commonly measured using polarographic and coulometric techniques known by persons or ordinary skill in the art. Oxygen permeability can be calculated by multiplying the oxygen transmissibility (Dk/t) of a lens by the mean thickness of the measured area. However, it appears that the polarographic techniques may not provide accurate measurements for high Dk silicone hydrogel contact lenses, such as silicone hydrogel contact lenses having a Dk greater than about 100 barrers. The variability associated with polarographic techniques may be related to the issue that for silicone hydrogel lenses having a Dk greater than 100 barrers, the measurements tend to plateau at Dk values greater than 100. The coulometric technique is frequently used to measure the Dk of lenses that are believed to have Dks greater than 100 barrers. Prior art soft silicon-containing hydrophilic contact lenses with higher water contents tend to have reduced or lower oxygen permeabilities. For example, a silicone hydrogel contact lens available under the tradename, Focus Night & Day (available from CIBA Vision Corporation), has a water content of about 24% and a Dk of about 140 barrers. Another silicone hydrogel contact lens available under the tradename, O2 Optix (available from CIBA Vision Corporation), has a water content of about 33% and a Dk of about 110 barrers. Another silicone hydrogel contact lens available under the tradename, Acuvue Oasys (available from Johnson & Johnson), has a water content of about 38% and a Dk of about 105 barrers. Another silicone hydrogel contact lens available under the tradename, PureVision (available from Bausch & Lomb), has a water content of about 36% and a Dk of about 100 barrers. Another silicone hydrogel contact lens available under the tradename, Acuevue Advance (available from Johnson & Johnson), has a water content of about 46-47% and a Dk of about 65 barrers. In comparison, a non-silicone hydrogel contact lens available under the tradename, Acuvue2 (available from Johnson & Johnson), has a water content of about 58% and a Dk of about 25 barrers. In addition, existing silicone hydrogel contact lenses have a modulus from between about 0.4 to about 1.4 mPa. For example, the Focus Night & Day contact lens has a modulus of about 1.4 mPa, the PureVision contact lens has a modulus of about 1.3 mPa, the O2 Optix has a modulus of about 1.0 mPa, the Advance contact lens has a modulus of about 0.4 mPa, and the Oasys contact lens has a modulus of about 0.7 mPa. In general, for existing silicone hydrogel contact lenses, as the Dk increases, the modulus of the lens increases. Furthermore, existing silicone hydrogel contact lenses do not have desirable surface wettabilities. For example, the Focus Night and Day contact lens has a wetting angle of about 67°, the PureVision contact lens has a wetting angle of about 99°, the O2 Optix contact lens has a wetting angle of about 60°, and the Advance contact lens has a wetting angle of about 107°. In comparison, non-silicone hydrogel contact lenses have wetting angles of about 30°. It is important that contact lenses be comfortable and safe to wear. For example, silicone hydrogel contact lenses should be comfortable and safe to wear for daily use, for overnight wear, and/or for wearing on an extended or continuous wear basis. One problem that arises in extended or continuous wear contact lenses is adhesion of the lens to the cornea during lens wearing which can result in wearer discomfort, eye irritation, corneal staining and/or other damage to the eye. Although lenses with high water contents are softer and more comfortable to wear, such prior art lenses may not have one or more properties useful to provide comfortable and safe wearing of the contact lenses. For example, existing contact lenses may not have a desirable Dk, a desirable surface wettability, a desirable modulus, a desired design, and/or a desirable water content. For example, silicone hydrogel contact lenses with a high Dk typically have a lower water content. In addition, such lenses are more stiff compared to lenses with a higher water content, and such lenses are less wettable. To reduce stromal anoxia during daily wear of contact lenses, it is desirable to produce a lens that has an oxygen transmissibility of at least about 45. Lenses, such as certain existing silicone hydrogel contact lenses, with an oxygen transmissibility greater than 50 have been developed to reduce stromal anoxia during daily wear. To help improve the properties of silicone hydrogel contact lenses, some lenses have been produced which include one or more surface treatments or surface modifications to attempt to make the lens surfaces more hydrophilic. Other lenses have been produced which include an interpenetrating network of polyvinylpyrollidone and a silicon-containing polymer. There continues to be a need for new silicone hydrogel contact lenses which have advantageous combinations of properties such as, enhanced flexibility or less stiffness, better wettability, and/or better lens designs. New contact lenses have been invented. For example, contact lenses which comprise a hydrophilic silicon-containing polymeric component (e.g., silicone hydrogel contact lenses) have been invented. The present lenses can be understood to be associated with one, two, or more of the following features, a natural wettability (e.g., an untreated surface wettability), a high Dk, a high water content, a low modulus, and designs that facilitate wearing the contact lenses with reduced discomfort. For example, the present lenses have one or more of the foregoing properties when compared to existing silicone hydrogel contact lenses. Or, stated differently, the present lenses have different values of one or more of the foregoing properties. The properties of the present lenses lead to reduced disomfort to the lens wearer wearing the present contact lenses compared to existing silicone hydrogel contact lenses. In certain embodiments, the present silicone hydrogel contact lenses have one or more surfaces that are not treated to become more hydrophilic, have no wetting agents, and/or are associated with low or no protein or lipid deposition. In certain embodiments, the present silicone hydrogel contact lenses have a relatively high Dk and a relatively high water content compared to existing silicone hydrogel contact lenses, such as those described herein. For example, the present silicone hydrogel contact lenses may have an equilibrium water content from about 30% to about 60% by weight, and a Dk from about 200 barrers to about 80 barrers. In one embodiment, a silicone hydrogel contact lens has an equilibrium water content from 20% to 70% by weight, and a Dk from 220 barrers to 60 barrers. One example of the present silicone hydrogel contact lenses has an equilibrium water content of about 30% by weight and a Dk of about 200 barrers. In certain embodiments, the present lens has an equilibrium water content greater than 20% by weight and a Dk greater than 160 barrers. Another example of the present silicone hydrogel contact lenses has a water content of about 60% by weight and a Dk of about 80 barrers. In one embodiment, a silicone hydrogel contact lens has a water content greater than 50% by weight and a Dk greater than 70 barrers. Yet another example of the present silicone hydrogel contact lenses has a water content of about 48% by weight and a Dk greater than 100 barrers. Thus, it can be understood that the present silicone hydrogel contact lenses may have higher water content and higher Dk relative to existing silicone hydrogel contact lenses. Certain embodiments of the present silicone hydrogel contact lenses have a relatively higher Dk and a relatively lower modulus compared to existing silicone hydrogel contact lenses, as described herein. For example, the present silicone hydrogel contact lenses may have a Dk from about 100 to about 200 barrers, and a modulus from about 0.4 mPa to about 1.4 mPa. One example of a silicone hydrogel contact lens has a Dk greater than 90 barrers and a modulus from 0.3 mPa to 1.5 mPa. In certain embodiments, the present silicone hydrogel contact lenses have a Dk of about 100 and a modulus of about 0.4 mPa. In other embodiments, the present silicone hydrogel contact lenses have a Dk of about 200 and a modulus of about 1.4. In yet other embodiments, the present silicone hydrogel contact lenses have a Dk of about 150 barrers and a modulus of about 0.8 mPA. In comparison, the existing Acuvue Advance silicone hydrogel contact lens has a modulus of about 0.4 mPa and a Dk of about 70. The existing Focus Night & Day silicone hydrogel contact lens has a modulus of about 1.4 and a Dk of about 130. Thus, certain embodiments of the present silicone hydrogel contact lenses have a relatively greater Dk, a relatively higher water content, and are relatively softer than existing silicone hydrogel contact lenses. The present silicone hydrogel contact lenses may comprise surfaces that have a greater wettability than existing silicone hydrogel contact lenses, such as those silicone hydrogel contact lenses described herein. As understood by persons of ordinary skill in the art, the wettability of a contact lens surface can be determined by measuring the wetting angle using a method, such as the sessile drop method. Lower wetting angles correspond to enhanced surface wettability. For purposes of comparison, existing silicone hydrogel contact lenses, such as those described herein, have surfaces that provide a wetting angle from about 60° to about 110°. The present silicone hydrogel contact lenses may comprise surfaces, such as the anterior and/or posterior surface, that have a wetting angle less than 60°. In certain embodiments, the present silicone hydrogel contact lenses have surfaces that have a wetting angle less than about 50°. In further embodiments, the present silicone hydrogel contact lenses have surfaces that have a wetting angle of about 30°. At least one example of the present contact lenses has a surface that has a wetting angle less thn 40°. The present contact lenses with the lower wetting angle, and therefore, enhanced surface wettability, have higher Dks, higher water contents, and/or lower modulus compared to existing silicone hydrogel contact lenses, as discussed herein. The present lenses may provide improvement or enhancement in patient comfort compared to existing silicone hydrogel contact lenses, as discussed herein. For example, whereas only about 15% of patients wearing existing silicone hydrogel contact lenses reported satisfactory comfort wearing the lenses, about 40% of patients wearing the present silicone hydrogel contact lenses reported satisfactory comfort wearing the lenses. In one specific embodiment, the present contact lenses have a Dk from about 115 to about 149 barrers, a water content of about 48% by weight, and a modulus of about 0.84 mPa. For example, a contact lens may have a Dk greater than 105 barrers, a water content greater than 45% by weight and a modulus greater than 0.8 mPa. In certain embodiments, the present silicone hydrogel contact lenses have a water content greater than about 50% by weight, a modulus from about 0.3 to about 0.5 mPa, and a Dk from about 70 to about 100 barrers. For example, a contact lens may have a water content greater than 50% by weight, a modulus from 0.2 mPa to 0.6 mPa, and a Dk greater than 60 barrers. Such embodiments may be useful as daily wear silicone hydrogel contact lenses. In additional embodiments, the present silicone hydrogel contact lenses have a Dk of at least about 120 barrers and a water content of at least about 48% by weight. Such embodiments may be useful as extended or continuous wear silicone hydrogel contact lenses. By way of comparison, as discussed herein, the Acuevue Advance silicone hydrogel contact lens has a Dk of about 105, a water content of about 46% by weight, and a modulus of 0.7 mPa. The present lenses are hydrophilic, and have unique and advantageous combinations of properties as described herein. The combinations of properties are helpful in evaluating appropriate conditions for wearing the present lenses. For example, certain combinations of properties, such as high water content, relatively lower Dk, and low modulus may be desirable or acceptable for daily wear silicone hydrogel contact lenses, such as lenses that can be worn overnight without cleaning, but that are typically disposed of on a daily basis. Other combinations of properties, such as high Dk, high water content, and low modulus may be effective in facilitating the use of such lenses in continuous or extended wear applications, such as for more than one night, such as for at least about five days, for example about two weeks or more, or at least about one month. The present contact lenses can be relatively easily and cost effectively produced. Using such lenses provides advantages, such as, vision correction with reduced lens handling and maintenance, continuous or extended wearing of contact lenses, while being ophthalmically compatible and providing for wearer comfort and safety. In one broad aspect, contact lenses comprise lens bodies that are configured to be placed or disposed on a cornea of an animal or human eye. The lens bodies comprise a hydrophilic silicon-containing polymeric material or materials. The lens bodies have Dk's or oxygen permeabilities of greater than about 70 barrers or about 80 barrers or about 100 barrers or about 105 barrers or about 110 barrers or about 115 barrers or about 120 barrers or about 125 barrers or about 130 barrers or about 150 barrers or about 180 barrers or about 200 barrers or more and equilibrium water contents of greater than about 15% or about 30% or about 35% or about 40% or more by weight. The present contact lenses are ophthalmically compatible, and advantageously are adapted and structured and/or are effective for continuous wear on a cornea of a human or animal eye, for example, for 1 day or 5 days or at least about 5 days or more. In one embodiment, the lens body, that is the ophthalmically compatible lens body, of the present contact lens, does not have, for example, is produced without, surface treatment or modification, such as on the anterior face and/or posterior face of the lens body. In certain prior art lenses such surface treatment was required to enhance surface wettability and/or one or more other properties of the lenses. The present lenses, advantageously have ophthalmic compatibility without requiring such surface treatment or modification. For example, the present lenses can be produced by polymerizing a lens precursor composition in a contact lens mold assembly to form a contact lens that can undergo extraction and packaging steps without requiring a post-polymerizing surface modification to remain sufficiently wettable when placed on an eye of an individual. In addition, some embodiments of the present lenses do not require polyvinylpyrollidone (PVP), such as a PVP containing interpenetrating network, and/or other additivies, to obtain the desired wettability of the present lenses. In certain embodiments, the present lenses are free of a surface modification or surface treatment and do not include a PVP-containing interpenetrating network. In other words, the present contact lenses can be produced by polymerizing or curing a lens precursor composition in a contact lens mold and extracting and hydrating the polymerized lens. The hydrated lens produced in the mold includes an anterior surface and/or posterior surface that is sufficiently wettable to be worn on an eye with reduced discomfort or without substantial discomfort, to a lens wearer, and without requiring a surface treatment. Thus, embodiments of the present invention may be understood to be non-surface treated silicone hydrogel contact lenses. In one embodiment, the lens bodies of the present contact lenses may have a combination of properties, including an effective or appropriate ionoflux to substantially inhibit, or even substantially prevent, corneal staining, for example, corneal staining more severe than superficial or moderate corneal staining, after the contact lens is worn continuously on a cornea of a human or animal eye for 8 hours or more, for example, for about 1 day, or about 5 days, or about 10 days, or about 20 days or about 30 days or longer. The oxygen permeability of the present lens bodies may be measured with the contact lens in the wet or fully hydrated state. The oxygen permeability or Dk is expressed as barrers, that is 10−10 (ml O2 mm)/(cm2 sec. mm Hg) or 10−10 ml O2 mm cm−2 sec.−1 mm Hg−1. Preferably, the lens body has a Dk of at least about 80 barrers or about 100 barrers or about 105 barrers or about 110 barrers or about 115 barrers or about 120 barrers or about 125 barrers or about 130 barrers, or at least about 150 barrers or about 180 barrers, or even at least about 200 barrers or more. The larger values of Dk of the present lens bodies are highly useful in that oxygen is substantially accessible to the cornea of an eye even when a contact lens is located on the cornea continuously from a prolonged period of time, as described herein. The present lens bodies may have effective or appropriate structural or mechanical characteristics, such as modulus, tear strength, elongation and/or one or more of the like properties, to withstand continuous contact lens wear for extended or prolonged periods of time, as described herein. For example, present lens bodies may have effective or appropriate modulus for use as continuous wear contact lenses. The present contact lenses include a lens body comprising a hydrophilic silicon-containing polymeric material. In one embodiment, the polymeric material comprise units from a silicon-containing monomer, for example, from two silicon-containing macromers having different molecular weights, and preferably different chemical structures. Such an embodiment may be particularly useful for continuous wear silicone hydrogel contact lenses, such as silicone hydrogel contact lenses that can be worn continuously for about 30 days. In another embodiment, the present contact lenses comprises only one silicon-containing macromer having a relatively high molecular weight. This embodiment, that is the embodiment comprising one silicon-containing macromer may be particularly useful for daily wear silicone hydrogel contact lenses that can be worn while sleeping, but that are typically discarded on a daily basis. These and other aspects and advantages of the present invention will become apparent in the following detailed description, examples and claims. The present contact lenses have unique and advantageous combinations of properties which facilitate the use of such lenses for prolonged wearing of the contact lenses by lens wearers. For example, the present lenses can be worn while a person sleeps. In certain embodiments, the lenses have properties that facilitate the use of the lenses for daily wear, which can include overnight wear. In other embodiments, the lenses have properties that facilitate use of the lenses in continuous or extended wear applications, such as for more than 5 days (e.g., for about 30 days). The present contact lenses provide advantages, such as, vision correction with reduced lens handling and maintenance, continuous or extended wearing of contact lenses, and being ophthalmically compatible and/or providing for wearer comfort and safety. In one broad aspect, the present invention provides silicone hydrogel contact lenses that comprise a non-surface treated lens body. The lens body comprises a hydrophilic, silicon-containing polymeric material, and has at least one of an oxygen permeability, a water content, a surface wettability, a modulus, and a design that is effective in facilitating ophthalmically compatible wearing of the contact lens by a lens wearer at least for one day. In certain embodiments, the lens body has two or more of the foregoing features, such as oxygen permeability, water content, surface wettability, modulus, and design. In additional embodiments, the lens body has three or more of the foregoing features. As used herein, ophthalmically compatible can be understood to refer to the wearing of the present lenses by a lens wearer with little or no discomfort, and little or no occurrence of features associated with existing silicone hydrogel contact lenses, such as lipid or protein deposition, corneal staining, and the like. In certain embodiments, the lens body has all of the aforementioned properties useful in lenses that are worn for at least one day, including daily wear lenses. In further embodiments, the lens body has all of the aforementioned properties useful in lenses that are worn for about thirty days, including continuous wear contact lenses. Certain embodiments, such as the present daily wear lenses, of the contact lenses comprise a hydrophilic silicon-containing polymeric material that comprises units from a hydrophilic silicon-containing macromer, such as one hydrophilic silicon-containing macromer. Other embodiments, including the present continuous wear contact lenses, of the contact lenses comprise a hydrophilic silicon-containing polymeric material that comprises units from two different hydrophilic silicon-containing macromers, each macromer having a different molecular weight. Embodiments of the present silicone hydrogel contact lenses comprise a lens body having an oxygen permeability of at least about 70 barrers, a water content of at least about 30% by weight, a modulus less than about 1.4 mPa, and a contact angle on a surface of the lens body less than about 60 degrees. In some embodiments, the lens body has an oxygen permeability greater than about 110 barrers. In some embodiments, the lens body has a water content greater than about 45% by weight. In some embodiments, the lens body has a modulus less than about 0.9 mPa. For example, one embodiment of the present silicone hydrogel contact lenses comprises a lens body that has an oxygen permeability of at least about 115 barrers, a water content of about 48% by weight, and a modulus of about 0.84 mPa. As another example, one embodiment of the present silicone hydrogel contact lenses comprises a lens body that has an oxygen permeability from about 70 barrers to about 100 barrers, a water content of at least about 50% by weight, and a modulus from about 0.3 mPa to about 0.5 mPa. These and other features of the present lenses are included in the following description and summary above. In another broad aspect, the present invention is directed to contact lenses which comprise lens bodies that are configured to be placed or disposed on a cornea of an animal or human eye. The lens bodies comprise a hydrophilic silicon-containing polymeric material or materials. The lens bodies have Dk's or oxygen permeabilities of greater than about 70 barrers or about 75 barrers or about 80 barrers or about 85 barrers or about 90 barrers or about 95 barrers or about 100 barrers or about 105 barrers or about 110 barrers or about 115 barrers or about 120 barrers or about 125 barrers or about 130 barrers or about 150 barrers or about 180 barrers or about 200 barrers, and equilibrium water contents of greater than about 15% or about 30% or about 35% or about 40% by weight. The present contact lenses are ophthalmically compatible, as defined herein, and are advantageously adapted and structured and/or are effective for continuous wear on a cornea of a human or animal eye, for example, for about 1 day or for about 5 days or for at least about 5 days or about 10 days or about 20 days or about 30 days or more. As used herein, the term “ophthalmically compatible” as applied to the present contact lenses and lens bodies may also be understood to mean that such lenses and lens bodies are effective to provide the following features in continuous wear applications: (1) allow oxygen to reach the cornea of an eye wearing the lens in an amount sufficient for long term corneal health; (2) cause no substantial undue corneal swelling or edema in an eye wearing the lens, for example, cause no more than about 5% or about 10% corneal swelling after being worn on a cornea of an eye during an overnight sleep; (3) allow movement of the lens on the cornea of an eye wearing the lens sufficient to facilitate tear flow between the lens and the eye, in other words, does not cause the lens to adhere to the eye with sufficient force to prevent substantially normal lens movement; (4) allow wearing of the lens on the eye without undue or significant discomfort and/or irritation and/or pain, for example, allow wearing of the lens with substantial comfort and/or substantial freedom from irritation and/or substantial freedom from pain; and (5) inhibit or substantially prevent lipid and/or protein deposition sufficient to substantially interfere with the functioning of the lens during wear, for example, inhibit or substantially prevent lipid and/or protein deposition sufficient to cause the lens wearer to remove the lens because of such deposition. Advantageously, such ophthalmically compatible contact lenses and lens bodies in addition inhibit, reduce, or even substantially prevent, corneal staining after the lens is continuously worn on a cornea of an eye, for example, during an overnight sleep. Corneal staining is a measure of corneal epithelium cell damage or destruction. The corneal epithelium is about 50 microns thick and comprise 5-7 layers of cells. The epithelium is constantly regenerated with the outermost layer of cells sloughing off into the tear film with the assistance of blinking. The innermost cell layer is pushed forward by new cell growth beneath and this layer gradually transforms to become the outermost layer of cells following repeated cycles of new growth over about 7 days. Damaged or dead epithelial cells are stained when exposed to sodium fluorescein. Thus, the degree of such staining can be used to measure the degree of cell damage/destruction. Some degree of corneal staining is often present with the wearing of conventional daily-wear and continuous wear contact lenses, and can occur even without contact lens wear. The use of sodium fluorescein is routinely used in clinical practice to identify the degree of corneal epithelial damage. This is because sodium fluorescein can passively accumulate into damaged cells or pool in areas where cells have been removed. One can determine the clinical significance of epithelial damage and, therefore, its management by evaluating both the extent of area of cornea which shows fluorescein staining as well as whether the fluorescein is able to penetrate and diffuse into the corneal stroma. The faster the time taken for the diffusion to occur into the stroma the greater number of layers have been damaged. Furthermore, the pattern of the staining is also a crucial indicator of the likely aetiology of the corneal staining e.g. superficial punctuate keratitis, superior epithelial arcuate lesions (SEALs), foreign body tracking, arcuate staining, etc. Grading scales have been developed for quantifying corneal staining and are well known. See Terry R L et al, “Standards for Successful Contact Lens Wear,” Optom. Vis. Sci. 70(3):234-243, 1993. In one embodiment, the present lenses are structured and/or have combinations of properties so as to substantially inhibit, even substantially prevent, corneal staining after the lens is continuously worn during an overnight sleep or for at least 1 day or at least 5 days or at least 10 days or at least 20 days or at least 30 days. For example, the wearing of the present lenses advantageously may result in corneal staining (staining grading scale of 1.0 or more) incidences of less than about 30% or about 20% or about 10%, based on a representative population of lens wearers. In the immediately preceding paragraph, the type of corneal staining considered is inferior corneal dehydration staining. This staining characteristically occurs in the inferior half of the cornea where the dehydration of the tear film on the anterior surface of the lens is greatest and during wear creates an osmotic gradient that draws water from the contact lens. If the lens is thin enough or the material has a propensity to lose water, e.g., has a relatively high ionoflux, then the osmotic gradient can be sufficiently great to dehydrate the tear film underneath the contact lens and subsequently dehydrate the corneal epithelium. This dehydration of the epithelium results in corneal damage and therefore corneal staining by fluorescein. This staining is usually limited to the superficial 2-3 layers of the epithelium and spread over the inferior portion of the cornea, but if the stimulus is sufficiently great, damage can be deep and severe allowing rapid diffusion of fluorescein into the stroma. The staining can occur rapidly within a few hours of lens insertion but usually takes 4-6 hours or more. Likewise the epithelial damage can resolve rapidly within 2-3 hours once the stimulus for dehydration has been removed. The greater the stimulus the faster the staining will be induced and the longer it will take to heal but typically it would not take more than 4-6 hours to resolve. In one embodiment, the lens bodies of the present contact lenses may have combinations of properties, including effective or appropriate ionofluxes, to substantially inhibit, or even substantially prevent, corneal staining, as described herein. In one useful embodiment, the present lens bodies have ionofluxes of no greater than about 5, more preferably no greater than about 4 or about 3, for example, no greater than about 2 or about 1 or less. Ionoflux is expressed as 10−3 mm2/min. The ophthalmically compatible lens bodies, of the present contact lenses may have no surface treatment or modification, for example, may be produced without surface treatment or modification, such as on the anterior face and/or posterior face of the lens body, to enhance surface wettability and/or one or more other beneficial properties of the lens bodies. Advantageously, no such surface treatment or modification is provided on either the anterior face or the posterior face of the present ophthalmically compatible lens bodies. By not having such surface treatment or modification, the lens manufacturing process is less complex and expensive, and more efficient. Further, with no such surface treatment/modification, the present lens bodies advantageously have more reproducible and/or more homogeneous surfaces. In addition, the lens wearer is not exposed to a surface treatment on the lens, which may, in and of itself, cause eye irritation and the like. The oxygen permeability of the present lens bodies is measured with the contact lens in the wet or fully hydrated state. The oxygen permeability or Dk is expressed as 10−10 (ml O2 mm)/(cm2 sec mm Hg) or barrer. Preferably, the lens body has a Dk of at least about 70 barrers or about 75 barrers or about 80 barrers or about 85 barrers or about 90 barrers or about 95 barrers or about 100 barrers or about 105 barrers or about 110 barrers or about 115 barrers or about 120 barrers or about 125 barrers or about 130 barrers, or about 150 barrers or about 180 barrers or even at least about 200 barrers or more. The relatively high values of Dk of the present ophthalmically compatible lens bodies are highly advantageous in that oxygen is substantially accessible to the cornea of an eye even when a contact lens is located on the cornea continuously for a prolonged period of time, as described herein. An additional mechanical property that may be effective in providing the present ophthalmically compatible contact lenses and lens bodies is elongation. The present lens bodies have sufficient elongations to facilitate lens handling ease, lens structural integrity, lens wear comfort, effective lens movement on the cornea and the like benefits. Lens bodies with insufficient elongation often suffer deficiencies in one or more of these areas. In a very useful embodiment, the present lens bodies have elongations of at least about 90% or about 100% or about 120%. Lens bodies having elongations of at least about 180% or about 200% are very useful. The Dk values of the present lens bodies, together with the equilibrium water contents and/or the relatively low ionofluxes and/or the relatively high elongations of the present lens bodies effectively facilitate ophthalmic compatibility of the present contact lenses and/or enhanced safety and comfort of the wearer of the present contact lenses, making continuous wear of such lenses more beneficial for the lens wearer. Moreover, in addition to the present ophthalmically compatible lens bodies having useful or effective Dk values and equilibrium water contents, and advantageously relatively low ionofluxes, such lens bodies preferably have sufficient structural or mechanical characteristics, such as modulus to reduce lens/eye interactions such as SEALs, contact lens papillary conjunctivitis (CLPC) and the like, tear strength, and/or one or more of the like mechanical properties, to allow or at least facilitate the lens bodies being able to withstand continuous contact lens wear for extended or prolonged periods of time, as described herein. The present ophthalmically compatible lens bodies have sufficient modulus for use as continuous wear contact lenses. In one useful embodiment, the modulus of the lens body is about 1.5 mPa , about 1.4 mPA, or about 1.2 mPa or less, preferably about 1.0 mPa or less and more preferably about 0.8 mPa or less or about 0.5 mPa or less or about 0.4 mPa or less or about 0.3 mPa or less. For example, one embodiment of the present lenses has a modulus of about 0.84 mPa. Another embodiment of the present lenses has a modulus from about 0.3 mPa to about 0.5 mPa. Lens bodies which have sufficient modulus for use as continuous wear contact lenses, but reduced modulus relative to prior art continuous wear lenses, for example, less than 1.0 MPa, are advantageous, for example, for the comfort of the wearer of the continuous wear contact lens. In a particularly useful aspect of the present invention, the present contact lenses include a lens body comprising a hydrophilic silicon-containing polymeric material. In one embodiment, the polymeric material comprises units from at least two silicon-containing macromers having different molecular weights, and preferably different chemical structures. Advantageously, one of the macromers has a number average molecular weight greater than about 5,000 or greater than about 8,000 or greater than about 10,000. In another embodiment, the polymeric material comprises units from only one silicon-containing macromer. For example, an embodiment of the present lenses comprises units of a silicon-containing macromer having a number average molecular weight of at least about 10,000. The polymeric material may comprise units from a silicon-containing macromer having a number average molecular weight of less than about 5,000, for example, less than about 3,000 or less than about 2,000. When units from two silicon-containing macromers are included in the polymeric material, such macromers advantageously have number average molecular weights which differ by at least about 3000 or about 5000, more preferably by at least about 10,000. In one useful embodiment, units from a high molecular weight silicon-containing macromer are present in the polymeric material in a greater amount by weight than are units of a low molecular weight silicon-containing macromer. For example, the weight ratio of high molecular weight macromer to low molecular weight macromer used to produce the present lens bodies may range from about 1.5 or about 2 to about 5 or about 7. Without wishing to limit the invention to any particular theory of operation, it is believed that the use of two different molecular weight silicon-containing macromers in producing the present lens bodies is advantageous in providing appropriate or effective high oxygen permeability and appropriate or effective equilibrium water content and/or relatively low ionoflux while providing lens bodies effective for use in continuous wear contact lenses, for example, ophthalmically compatible contact lenses that can be worn for about thirty days, if desired. The use of different molecular weight silicon-containing macromers provides compatibility with the other components used to produce the lens bodies, and may provide a degree of heterogeneity in the present lens bodies, for example, on a molecular level, that at least facilitates providing a lens body having a desirable combination of physical properties which facilitates the lens body being highly advantageous for use in a continuous wear contact lens. In other embodiments comprising units from one silicon-containing macromer, appropriate lens properties can be obtained that facilitate use of the lenses on a daily basis, such as for overnight wear. In one useful embodiment, one of the silicon-containing macromers, preferably the low molecular weight macromer, is mono-functional, that is it comprises only one group per molecule which participates in the polymerization reaction to form the silicon-containing polymeric material. Without wishing to limit the invention to any particular theory of operation, it is believed that the mono-functional macromer facilitates or enhances component compatibility and/or heterogeneity, for example, on a molecular level, of the polymeric material. That is, the morphology of the polymeric material of the lens body is believed to be sufficiently non-uniform or heterogenous such that different phase domains are present in the polymeric material. This enhanced heterogeneous morphology is believed to enhance the ophthalmic compatibility of the polymeric material and/or to increase at least one of the Dk and the equilibrium water content and/or reduce the ionoflux, while maintaining or even reducing the modulus of the polymeric material, relative to a similar polymeric material comprising units from only one silicon-containing macromer or relative to a similar polymeric material comprising units from two silicon-containing macromers both of which have at least two functional groups per molecule. In any event it has been found that contact lenses with unique and advantageous combinations of properties, which combinations of properties make the present lenses ophthalmically compatible, and advantageously highly effective for continuous or extended wear, can surprisingly be provided by selecting and processing macromers and monomers, as described herein, into lens bodies of contact lenses. There is no limitation in a composition of the contact lenses of the present invention so long as the lenses have the combinations of properties and/or perform in daily wear applications or continuous or extended wear applications as set forth herein. In one embodiment, contact lenses in accordance with the present invention include a polymer containing units from a hydrophilic siloxanyl methacrylate shown by formula I.
wherein, R1, R2, R3 and R4 are groups independently selected from hydrocarbon groups having 1 to about 12 carbon atoms and a siloxanyl group, such as a trimethylsiloxy group; and the structure [Y1] is a polysiloxane backbone comprising not less than 2 siloxane units; R5 is a hydrogen or a methyl group; Z1 is a group selected from —NHCOO—, —NHCONH—, —OCONH—R6—NHCOO—, —NHCONH—R7—NHCONH— and —OCONH—R8—NHCONH—, with R6, R7 and R8 independently selected from hydrocarbon groups having 2 to about 13 carbon atoms; m is an integer from 0 to about 10; n is an integer from about 3 to about 10; p is 0 when m is 0 and 1 when m is 1 or greater; and q is an integer from 0 to about 20.
wherein R9 and R10 are groups selected from hydrocarbon groups having 1 to about 12 carbon atoms, for example, methyl groups, hydrocarbon groups substituted with one or more fluorine atoms, trimethylsiloxy groups, and hydrophilic substituents, and may be different from each other in the sequential chain; and r is an integer from about 7 to about 1000. Use of such a hydrophilic siloxanyl methacrylate in accordance with the present invention provides contact lenses with high oxygen permeability, reduced deposition of proteins and lipids, superior or enhanced maintenance of lens water wettability during continuous lens wear, acceptable lens movement on the cornea of an eye, and reduced adhesion to a cornea. wherein, g is an integer from 1 to about 10.
wherein R22 is a hydrocarbon group having about 3 to about 12 carbon atoms and may have —O—, —CO— or —COO— group inserted between carbon atoms; R23 is a hydrocarbon group having about 2 to about 4 carbon atoms and the number of carbon atoms may be different from each other when j is not less than 2; j is an integer from 1 to about 200; Z2 is a group selected from hydrogen, hydrocarbon groups having about 1 to about 12 carbon atoms and —OOCR24, where R24 is a hydrocarbon group having about 1 to about 12 carbon atoms. Examples of hydrophilic groups comprise, without limitation: monohydric alcohol substituents such as —C3H6OH, —C8H16OH, —C3H6OC2H4OH, —C3H6OCH2CH(OH)C3, —C2H4COOC2H4OH, —C2H4COOCH2CH(OH)C2H5 and the like; polyhydric alcohol substituents such as —C3H6OCH2CH(OH)CH2OH, —C2H4COOCH2CH(OH)CH2OH, —C3H6OCH2C(CH2OH)3 and the like; and polyoxyalkylene substituents such as —C3H6(OC2H4)4OH, —C3H6 (OC2H4)30OH, —C3H6(OC2H4)10OCH3, —C3H6(OC2H4)10,—(OC3H6)10OC4 H9 and the like. Among these, particularly useful groups comprise: alcohol substituents such as —C3H6OH, —C3H6OCH2CH(OH)CH2OH and —C3H6OC2H4OH; and polyoxyethylene substituents such as —C3H6(OC2H4)kOH and —C3H6(OC2H4)LCH3 wherein each of k and l independently is an integer from about 2 to about 40, preferably about 3 to about 20, from the viewpoints of superior hydrophilicity and oxygen permeability. One or more fluorine-containing substituents provide staining resistance to the polymeric material, but an excess substitution may impair hydrophilicity. A hydrocarbon substituent having 1 to about 12 carbon atoms linked with fluorine atoms is very useful. Such useful fluorine-containing groups comprise, without limitation: 3,3,3-trifluoropropyl group, 1,1,2,2-tetrahydrofluorooctyl group, 1,1,2,2-tetrahydroperfluorodecyl group and the like. Among these, 3,3,3-trifluoropropyl group is very useful in view of the hydrophilicity and oxygen permeability obtained in the resulting lens body. Besides the hydrophilic substituents and the fluorine-containing substituents, substituents linked to silicon atoms may comprise, without limitation, hydrocarbon groups having one to about 12 carbon atoms, trimethylsiloxy groups and the like, and may be the same or different from each other. A very useful group is an alkyl group having 1 to about 3 carbon atoms, and methyl group is particularly useful. In the general formula I, m advantageously is an integer from 0 to about 4. If m is about 5 or greater, the monomer may become too hydrophobic to be compatible with the other monomers, giving a cloudiness during polymerization and difficulty in homogeneous mixing of the monomers. In the formula (3a), if g is greater than about 10, the monomer may have reduced compatibility with the other monomers. 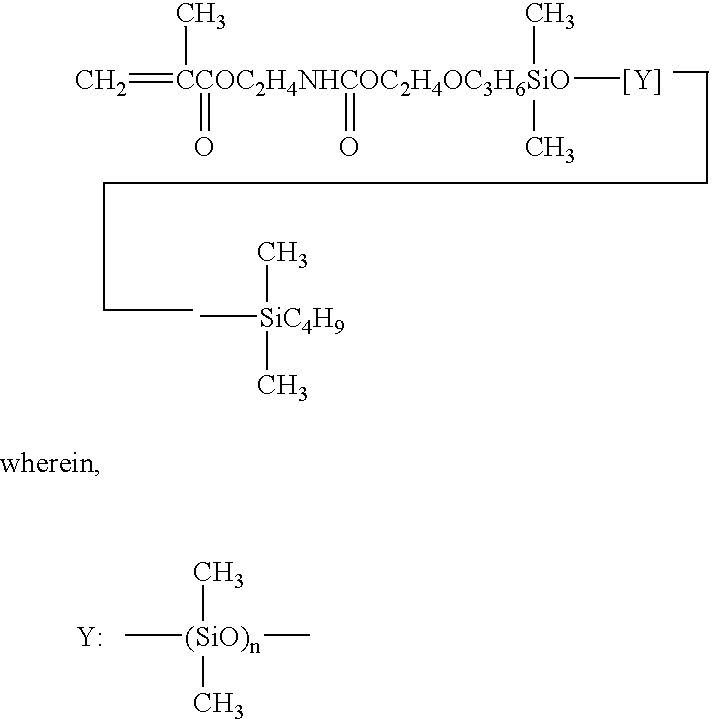 The above described hydrophilic siloxanyl methacrylate may be synthesized by reacting 2-isocyanatoethyl methacrylate with siloxanylalkyl alcohol. The present contact lenses may have equilibrium water contents in a range of about 25-60% by weight, comprise hydrophilic silicon-containing polymeric material, and have oxygen permeabilities, expressed as Dk, of not less than about 80 or about 90 or about 100 or about 110 or about 120. The lenses may provide one or more, for example, at least 2 or 3 or more, and advantageously all, of the following: reduced adsorption of proteins and lipids to the inner part of lens; easy lens care, acceptable lens movement on the eye, acceptable stability in lens shape, flexibility and wear comfort, thus enabling use in continuous wear applications. In one very useful embodiment, the present contact lenses are sufficiently ophthalmically compatible to be effective for continuous wear for at least 5 days or at least 10 days or at least 20 days or at least 30 days. Water contents less than 5% or less than 15% by weight are often undesirable due to an easy adsorption of lipids to lens, potentially resulting in adhesion of the lens to the cornea of the eye wearing the lens. Water contents over 60% are often undesirable, giving the lens low strength, lens dehydration, poor scratch resistance in handling, easy fracture and high adsorption of proteins. Lenses with oxygen permeabilities lower than a Dk of about 80 are undesirable in continuous wear lenses. Lenses with tensile modulus less than about 0.2×107 dyne/cm2 (MPa) are often undesirable due to relative instability in lens shape and difficulty in lens handling. Lenses with tensile modulus over about 1.5×107 dyne/cm2 (Mpa) or about 2×107 dyne/cm2 (Mpa) are undesirable, for example, because of a significant decrease in lens movement on the cornea and an increased occurrence of adhesion to the cornea, lens flexure problems, comfort issues during lens wearing and the like concerns. wherein h is an integer from about 8 to about 70 and R11 is a non-polymerizable or non-functional group, for example, a hydrocarbon group having about 1 to about 6 carbon atoms. In one very useful embodiment R11 is —C4H9. The compound identified in formula (Ib), in one embodiment, may be considered a macromer, for example, having a molecular weight in a range of about 1,000 to about 3,000 or about 5,000. The integer h is selected to provide a macromer with the desired molecular weight. Such a macromer is particularly useful in combination with another silicon-containing macromer having a higher molecular weight, as described elsewhere herein. For example, and without limitation, a compound of the general formula I, for example, by proper selection of the value for “r”, can be a macromer having a number average molecular weight of at least about 5000 or about 8,000 or about 10,000 to about 25,000 or more. Such a high molecular weight macromer can be used in combination with a low molecular weight macromer, for example, as illustrated by formula Ib, to produce lens bodies for contact lenses which are sufficiently ophthalmically compatible to be effective in continuous wear applications, as described elsewhere herein. In one embodiment, the use of the combination of such high and low molecular weight silicon-containing macromers to produce a contact lens body provides for enhanced ophthalmic compatibility and/or enhanced effectiveness in such continuous wear applications relative to a substantially identical contact lens body produced without one of the high molecular weight macromer or the low molecular weight macromer. Any polymer which contains units from one or more hydrophilic silicon-containing monomers and/or macromers described herein can be used in the contact lenses of the present invention. For example, the polymer may include copolymers with the following copolymerizable compounds: acrylic monomers such as methyl acrylate, ethyl acrylate and acrylic acid; methacrylic monomers such as methyl methacrylate, ethyl methacrylate, 2-hydroxyethyl methacrylate and methacrylic acid; siloxane monomers such as tris(trimethylsiloxy)silylpropyl methacrylate, bis(trimethylsiloxy)methylsilylpropyl methacrylate, pentamethyldisiloxanepropyl methacrylate, tris(trimethylsiloxy)silylpropyloxyethyl methacrylate, and tris(polydimethylsiloxy)silylpropyl methacrylate; fluorosiloxane monomers such as tri(dimethyltrifluoropropylsiloxy)silylpropyl methacrylate; fluoroalkyl monomers such as 2,2,2-trifluoroethyl methacrylate, 2,2,3,3,3-pentafluoropropyl methacrylate and hexafluoroisopropyl methacrylate; fluoroalkyl and fluoroalkylether monomers containing hydroxyl group such as 1,1,2,2-tetrafluoroethoxy-2-hydroxypropyl methacrylate; hydrophilic monomers such a N-vinylpyrrolidone, N,N′-dimethylacrylamide and N-vinyl-N-methylacetamide; crosslinkable monomers such as ethylene glycol dimethacrylate, tetraethylene glycol dimethacrylate and tetramethyldisiloxanebis (propylmethacrylate). Among these, copolymers with siloxane methacrylates, fluoroalkylsiloxane methacrylates, fluoroalkyl methacrylates, fluoroalkylether methacrylates containing hydroxyl groups, hydrophilic monomers, crosslinkable monomers with two or more unsaturated groups within a molecule and siloxane macromers with polymerizable unsaturated groups at molecular ends are preferable because of well-balanced physical properties such as oxygen permeability, stain deposition resistance and mechanical strength. Preferable hydrophilic monomers in the present invention are amide monomers containing N-vinyl group, and N-vinylpyrrolidone or N-vinyl-N-methylacetamide, in particular, can provide a contact lens with superior surface wettability. An example, without limitation, of such a contact lens comprises a polymer material derived from about 30% to about 70% or about 80% by weight of hydrophilic silicon-containing monomer(s) or macromer(s), about 5% to about 50% by weight of N-vinylpyrrolidone, 0% to about 25% by weight of N-vinyl N-methylacetamide, 0% to about 15% by weight of 2-hydroxybutyl methacrylate, 0 to about 10% by weight isobornyl methacrylate, 0% to about 15% methyl methacrylate, by weight and about 0.005% to about 5% by weight of a crosslinker compound. The contact lenses of the present invention can be manufactured by conventional lens manufacturing methods. Such methods comprise, for example and without limitation a method by lathe-cutting of polymer block followed by polishing, a method to cast a monomer (and a macromer) composition into a mold with corresponding lens shape followed by polymerization, and a method to form only one face of lens by casting method using a polymerization mold then finish the other face by lathe-cutting and polishing method, etc. wherein e and f is an integer from about 2 to about 40, preferably about 2 to about 20. The monomer of formula II can be considered a macromer, for example, a bifunctional macromer. For example, the molecular weight of the macromer of formula II can be controlled by controlling the number of structural units (I′) and (II′) in the macromer. In one useful embodiment, the formula II macromer has a relatively high molecular weight, for example, at least about 5000, and preferably in a range of about 10,000 to about 25,000 or more (number average molecular weight). The formula II macromer can be used alone, that is as the only silicon-containing monomer, in the present contact lenses. Advantageously, the high molecular weight macromer is used in combination with a low molecular weight macromer, as described elsewhere herein to form the polymeric material included in the present lenses or lens bodies. In this embodiment, the units from monomer(s) or macromer(s) may make up about 30% or about 40% to about 70% or about 80% by weight of the polymeric material. In the event that both high and low molecular weight silicon-containing macromers are used, the high molecular weight macromer comprises at least about 20% or about 30% or about 40% by weight of the polymeric materials. In one useful embodiment, units from the combination of the high molecular weight macromer and the low molecular weight macromer are at least about 30% or about 40% or about 50% by weight of the polymeric material. The above described monomer or macromer of Formula II may be copolymerized with one or more other monomers and/or macromers, for example, as described elsewhere herein. A contact lens comprising the above described polysiloxane monomer or monomers (macromer or macromers) as a main or primary component can be manufactured by conventional lens manufacturing methods such as the casting method in which a monomer composition is injected into a polymerization mold with a corresponding lens shape followed by a polymerization. A lens manufactured by using a mold made of a material with polar groups at the surface of the mold, such as molds made of ethylene-vinyl alcohol (EVOH) copolymer, polyamide, and polyethylene terephthalate, are preferred. Such molds are believed to be effective in facilitating the formation of a thick stable hydrophilic layer at the surface of the lens body, little or no change in surface characteristics during continuous or extended wear of the lens, together with substantially stable lens performance, such as superior water wettability and reduced deposition of proteins and lipids during such wear. Advantageously, lenses produced in such molds, including EVOH molds, have desired surface wettabilities without requiring a surface treatment or surface modification that is associated with certain existing silicone hydrogel contact lenses. In this specification, the structural units of the formulas [I] and [II] of the silicon-containing monomers or macromers are expressed as a block type linkage, but the present invention also comprises a random linkage type. It is preferable from the viewpoint of polymerization that polymerizable unsaturated groups are linked to the ends of siloxane chain and structure of the unsaturated group is acrylate or methacrylate group. As a linking group to Si atoms, hydrocarbon groups containing urethane or urea linkages are preferable, and may be linked to Si atoms through oxyethylene groups. Urethane or urea linkages are highly polar and enhance the hydrophilic property and strength of the polymer. A structure having two such groups can be formed by a reaction between diisocyanate linkages and a hydroxyl- or amine-containing molecule having about 2 to about 13 carbon atoms and may be linear, cyclic or aromatic types. 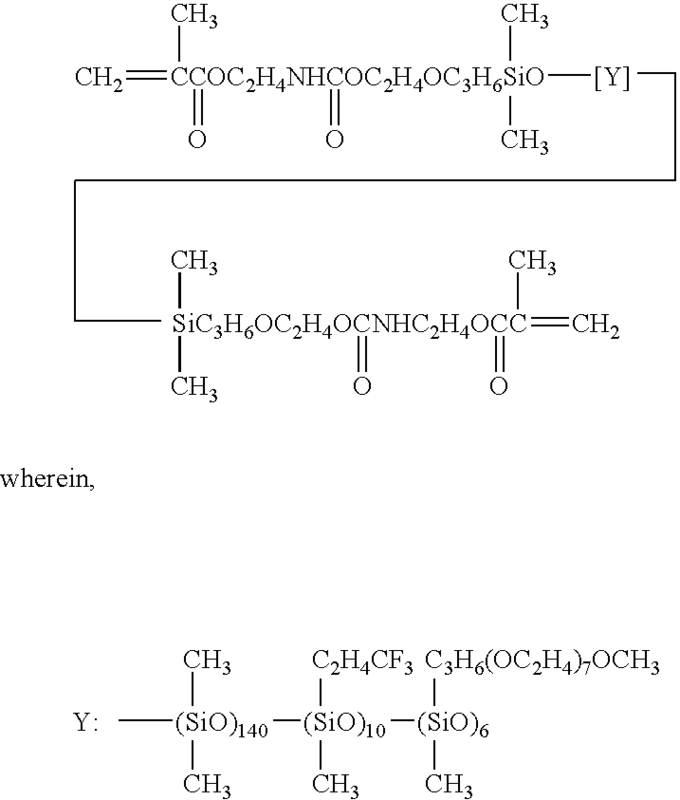 There are various synthesis methods for the hydrophilic silicon-containing monomers (macromers). A number of such methods employ reagents and reactions and synthesis strategies and techniques which are conventional and well known in the art, for example, in the art of silicone polymer chemistry. An example of a useful synthesis method comprises the following: A ring-opening polymerization of a mixture of cyclic siloxane with hydrosilane groups (Si—H), cyclic siloxane with hydrocarbon groups, and disiloxane with hydroxyalkyl groups at both ends, along with cyclic siloxane with fluorine-substituted hydrocarbon groups in certain cases, is performed using an acidic catalyst, such as sulfuric acid, trifluoromethanesulfonic acid and acidic clay to obtain hydrosilyl-group-containing polysiloxane compounds having hydroxyl groups at both ends. In this case, siloxane compounds with various degrees of polymerization and introduction ratios of fluorine-containing substituent and hydrosilyl groups can be obtained by changing feed ratios of each cyclic siloxane and disiloxane compounds used. Isocyanate substituted acrylates or isocyanate substituted methacrylates are then reacted with hydroxyl groups at the ends of polysiloxane to obtain urethane-containing fluorinated siloxane compounds with polymerizable unsaturated groups at both ends. The presently useful monofunctional macromers may be produced using conventional and well known chemical synthesis techniques. For example, a monofunctional hydroxyl polysiloxane, such as a commercially available monofunctional hydroxyl polysiloxane, can be reacted with an isocyanate-substituted acrylate or an isocyanate-substituted methacrylate in the presence of a catalyst, for example, tin-containing catalyst, at conditions effective to obtain a mono-terminated acrylate or methacrylate polysiloxane macromer. Useful isocyanate-substituted methacrylates comprise, without limitation, such monomers as methacryloxyethylisocyanate, methacryloylisocyanate, and the like and mixtures thereof. Isocyanate compounds with acrylate or methacrylate groups obtained by reacting hydroxyl-group-containing acrylates or methacrylates, such as hydroxyethyl methacrylate and hydroxybutyl acrylate, with various diisocyanate compounds can also be utilized. 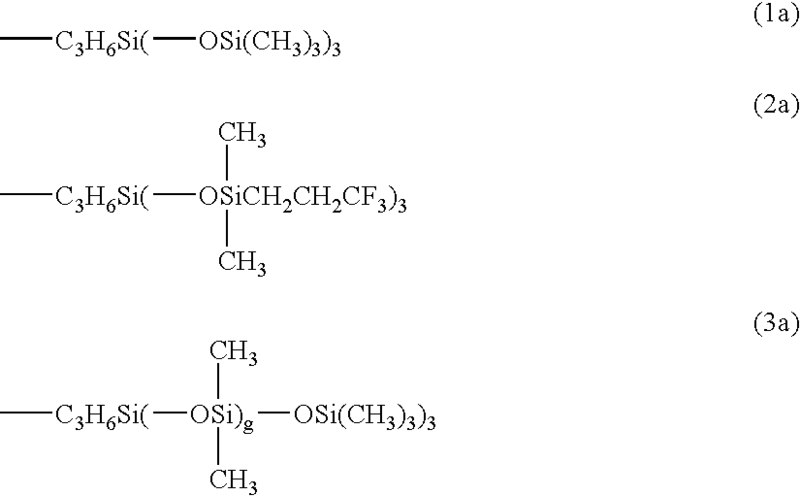 Hydrophilic polysiloxane monomer and/or macromers can be obtained by adding an unsaturated-hydrocarbon-group-containing hydrophilic compound to the hydrosilane using a transition metal catalyst, such as chloroplatinic acid and the like, utilizing the so called hydrosilylation reaction. In the hydrosilylation reaction, it is known that a dehydrogenation reaction occurs as a side reaction if an active hydrogen compound, such as hydroxyl group and carboxylic acid and the like, is present. Therefore, if these active hydrogen atoms are present in a hydrophilic compound to be introduced, the side reaction should be suppressed by protecting the active hydrogen atom in advance or adding buffer agents. For example, see U.S. Pat. No. 3,907,851, the disclosure of which is incorporated in its entirety by reference herein. Another route of synthesis is as follows: After synthesis of a hydrosilyl-group-containing polysiloxane compound having hydroxyl groups at both ends, a hydrophilic group or moiety is introduced by hydrosilylation in advance, then polymerizable groups are introduced to both ends of the siloxane by reacting with isocyanate-substituted methacrylate or the like. In this case, if active hydrogen, which is reactive to the isocyanate, is present in the hydrophilic compound, the side reaction with isocyanate must be prevented, for example, by introducing a protective group. 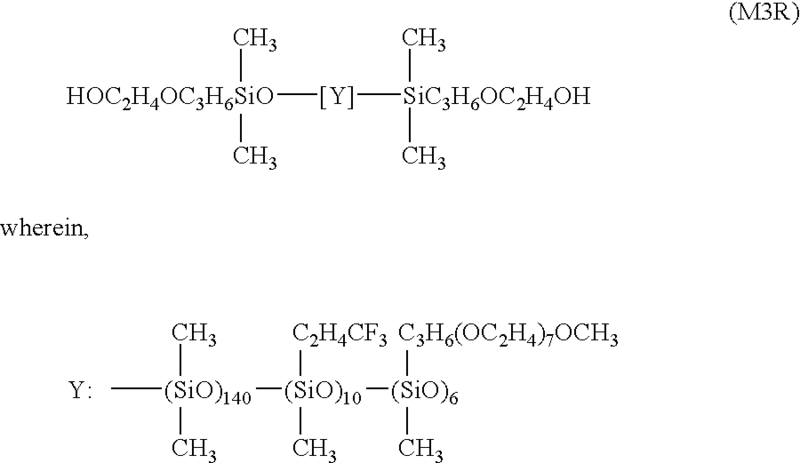 Alternatively, for example, a silicate ester derivative, such as dimethoxy silane, a diethoxysilane compound, and the like, instead of a cyclic siloxane, can be used as a starting raw material. Mixtures of two or more hydrophilic polysiloxane monomers thus obtained can also be used. Any polymer which comprises units from one or more hydrophilic silicon-containing monomers and/or macromers described herein can be used in the contact lenses of the present invention. At least one hydrophilic monomer may be employed as a comonomer component in addition to the hydrophilic silicon-containing monomer or macromer. Preferably an amide monomer, for example, an amide monomer containing an N-vinyl group, is useful to obtain superior transparency, staining resistance and surface wettability. Without wishing to limit the invention to any particular theory of operation, it is believed that a phase-separated structure, on a molecular level, may be formed in the copolymerization with the hydrophilic polysiloxane monomer (macromer) or monomers (macromers) disclosed in the present invention, for example, due to differences in copolymerizability, molecular weight, polarity and the like between two or more of these monomers resulting in providing stable staining resistance, enhanced hydrophilicity and enhanced oxygen permeability, and preferably an enhanced degree of ophthalmic compatibility. An amide monomer containing an N-vinyl group may be selected, without limitation from N-vinyl formamide, N-vinyl acetamide, N-vinyl isopropylamide, N-vinyl-N-methyl acetamide, N-vinyl pyrrolidone, N-vinyl caprolactam and the like and mixtures thereof. N-vinyl-N-methyl acetamide and N-vinyl pyrrolidone are very useful. Useful polymeric materials in accordance with the present invention comprise copolymers obtained by addition of monomers other than the hydrophilic polysiloxane monomer(s) and the amide monomer containing N-vinyl group. Any monomer can be used in the present invention so long as it is copolymerizable, and hydrophilic monomers, among them, are useful. Useful hydrophilic monomers have good compatibility with the hydrophilic polysiloxane monomer(s) and/or macromer(s) and also can further improve surface wettability of the polymeric material and modify water content. Useful hydrophilic monomers comprise, for example and without limitation, monomers containing one or more hydroxyl groups, which monomers can improve mechanical properties, e.g., strength, elongation, tear strength and the like, such as 2-hydroxyethyl methacrylate, 2-hydroxypropyl methacrylate, 3-hydroxypropyl methacrylate, 2-hydroxybutyl methacrylate, 1-hydroxymethylpropyl methacrylate, 4-hydroxybutyl methacrylate and glycerol methacrylate; monomers containing fluorine-substituted groups such as 3-(1,1,2,2-tetrafluoroethoxy)-2-hydroxypropyl methacrylate; and acrylates corresponding to the methacrylates set forth herein. 2-hydroxyethyl methacrylate, 2-hydroxypropyl methacrylate, 2-hydroxybutyl methacrylate and mixtures thereof are very useful. Other useful hydrophilic monomers includes, for example, and without limitation, monomers containing carboxyl groups such as methacrylic acid, acrylic acid and itaconic acid; monomers containing alky substituted amino groups such as dimethylaminoethyl methacrylate and diethylaminoethyl methacrylate; acrylamide or methacrylamide monomers such as N,N′-dimethylacrylamide, N,N′-diethylacrylamide, N-methylacrylamide, methylenebisacrylamide and diacetoneacrylamide; monomers containing oxyalkylene groups such as methoxypolyethylene glycol monomethacrylate and polypropylene glycol monomethacrylate and the like and mixtures thereof. Siloxanyl acrylates are useful comonomers, for example, to adjust oxygen permeability. 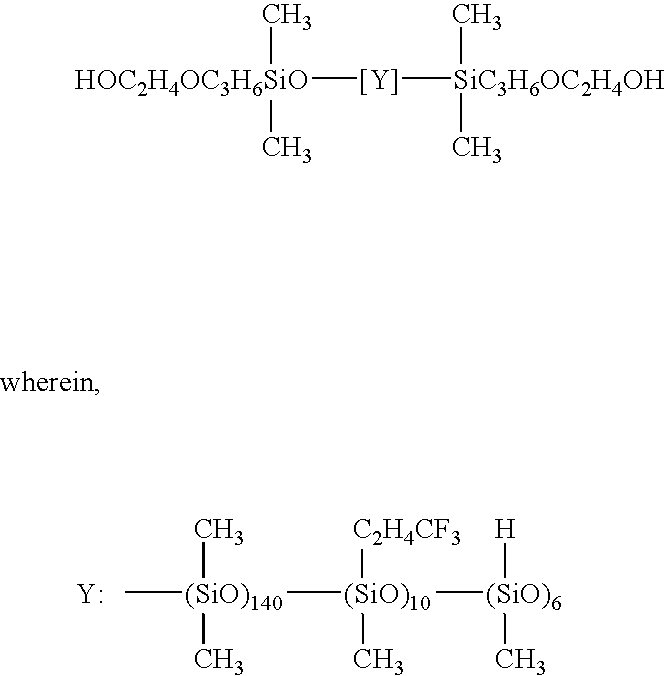 For example, such monomers comprise, without limitation, tris(trimethylsiloxy)silylpropyl methacrylate, bis(trimethylsiloxy)methylsilylpropyl methacrylate pentabmethyldisiloxanyl methacrylate and the like and mixtures thereof. Polymerizable polydimethylsiloxanes substituted with methacrylate groups and the like and mixtures thereof can also be used for the similar objective. Other monomers, which can be utilized, comprise, without limitation, fluorinated monomers, such as fluoroalkyl acrylates and fluoroalkyl methacrylates, for example, trifluoroethyl acrylate, tetrafluoroethyl acrylate, tetrafluoropropyl acrylate, pentabfluorpropyl acrylate, hexafluorobutyl acrylate, hexafluoroisopropyl acrylate, methacrylates corresponding to these acrylates and the like and mixtures thereof. Furthermore, alkyl acrylate monomers and alkyl methylacrylate monomers can also be used if necessary and/or desired. They comprise, for example and without limitation, methyl acrylate, ethyl acrylate, n-propyl acrylate, n-butyl acrylate, stearyl acrylate methacrylates corresponding to these acrylates and the like and mixtures thereof. In addition, monomers with high glass transition temperature (Tg), such as cyclohexyl methacrylate, tert-butyl methacrylate and isobornyl methacrylate and the like and mixtures thereof can also be used to enhance mechanical properties. Moreover, crosslinkable monomers other than hydrophilic polysiloxane monomers can be used to improve mechanical properties and stability and adjust water content. For example, they comprise, without limitation, ethylene glycol dimethacrylate, diethylene glycol dimethacrylate, tetraethylene glycol dimethacrylate, polyethylene glycol dimethacrylate, trimehtylolpropane trimethacrylate, pentaerythritol tetramethacrylate, bisphenol A dimethacrylate, vinyl methacrylate; acrylates corresponding to these methacrylates; monomers containing one or more alkyl groups, such as, without limitation, triallyl isocyanurate, triallyl cyamurate, triallyl trimelitate and allylmethacrylate; siloxane derivatives such as 1,3-bis(3-methacryloxypropyl)tetramethyldisiloxane and the like and mixtures thereof. wherein, R24 and R26 are independently selected from hydrogen and methyl group; Z3 is an urethane linking group; R25 is selected from hydrocarbon group having 2 to about 10 carbon atoms and polyoxyethylene group expressed by —(C2H4O)uC2H4— wherein u is an integer from 2 to about 40; t is an integer from 0 to about 10; s is 0 when t is 0 and 1 when t is 1 or greater. Without wishing to limit the invention to any particular theory of operation, it is believed that the above bifunctional compounds have good compatibilities and copolymerizability and contribute to strength improvement by intermolecular interaction because the hydrophilic polysiloxane monomers have similar backbones, for example urethane group-containing backbones. Examples of crosslinkable monomers with urethane linkages including, without limitation, 2-methacryloylcarbamoyloxyethyl methacrylate, 2-2(2-methacryloxycarbamoyloxy)ethyl acrylate, 2-(2-methacryloxyethylcarbamoyloxy)propyl methacrylate, 2-methacryloxyethylcarbamoyloxytetraethylene glycol methacrylate and the like and mixtures thereof. These crosslinkable monomers can be used alone or in combination. In order to improve a balance of characteristics of a hydrophilic polymeric material, such as optical characteristics, oxygen permeability, mechanical strength, recovery from deformation, staining resistance during contact lens wearing, dimensional stability in tear and durability, mixed monomers of these copolymerizable monomers can be used. An example, without limitation, of such a contact lens comprises a polymer material derived from about 30% to about 70% or about 80% by weight of hydrophilic silicon-containing monomer(s) or macromer(s), about 5% to about 50% by weight of N-vinylpyrrolidone, 0% or about 0.1% to about 25% by weight of N-vinyl N-methylacetamide, 0% or about 0.1% to about 15% by weight of 2-hydroxybutyl methacrylate, 0% or about 0.1% to about 15% by weight of methyl methacrylate, and about 0.005% to about 5% by weight of a crosslinker compound. Various additives may further be added before or after polymerization, if necessary. Examples of additives comprise, without limitation, dyes or pigments with various coloring characteristics, UV absorbers and the like and mixtures thereof. Furthermore, when a lens is manufactured using a mold, mold releasing agents such as surfactants and the like and mixtures thereof can be added to improve separation of lens from the mold. One embodiment of the present silicone hydrogel contact lenses comprises a material having the United States Adopted Name (USAN) comfilcon A. The contact lenses of the present invention can be manufactured by conventional lens manufacturing methods. The methods include, for example a method by lathe-cutting of polymer block followed by polishing, a method to cast a monomer (and a macromer) composition into a mold with corresponding lens shape followed by polymerization, and a method to form only one face of lens by casting method using a polymerization mold then finish the other face by lathe-cutting and polishing method, etc. A polymeric material used for a contact lens of the present invention is formed to an ophthalmologic lens by a mold method in which a monomer mixture comprising, for example, one or more hydrophilic polysiloxane monomers and an amide monomer containing N-vinyl group, is filled into a mold, followed by a radical polymerization by the known method, or by a spin casting method in which a monomer mixture is fed in a rotatable hemisphere mold, followed by a polymerization. In these cases, polymerization of a solution of monomer mixture added with solvents in a mold may be utilized to adjust the degree of polymerization or lens swelling ratio. If a solvent is included, solvents which dissolve the monomers effectively are advantageously used. Examples include, without limitation alcohols such as ethanol and isopropanol; ethers such as dimethylsulfoxide, dimethylformamide, dioxane and tetrahydrofran; ketones such as methylethyl ketone; esters such as ethyl acetate; and the like and mixtures thereof. Any mold material can be used for mold polymerization or casting polymerization, so long as it is substantially insoluble to monomer mixture and lens can be separated after polymerization. For example, polyolefin resins such as polypropylene and polyethylene can be used, and materials having polar groups at a surface are preferable. As used herein, a polar group means an atomic group with strong affinity with water and comprises hydroxyl groups, nitrile groups, carboxyl groups, polyoxyethylene groups, amide groups, urethane groups and the like. Very useful mold materials are insoluble to a polymerization monomer composition and have contact angles to water at least at the part for forming one lens surface, not higher than about 90°, preferably about 65° to about 80°, by the sessile drop method. A contact lens formed using a mold material having surface contact angle smaller than 80° shows particularly superior water wettability and stable performance in lipid deposition and the like. A mold material having surface contact angle smaller than 65° is not advantageous because of difficulty in separating from the mold after polymerization, resulting in minute surface damage or fractures at an edge part of lens. A mold material soluble to monomer compositions is also difficult to use because of difficulty in separating the lens as well as rough lens surfaces and low transparency. More preferably, a mold material is a resin selected from polyamides, polyethylene terephthalates and ethylene-vinyl alcohol copolymers (EVOH) and the like. Ethylene-vinyl alcohol copolymers are particularly useful, for example, from the viewpoints of an easiness in molding, providing a dimensionally stable mold and giving stable water wettability to the molded lens. An example of an ethylene-vinyl alcohol copolymer resin product to be used is available as “Soarlite” from The Japan Synthetic Chem. Ind. Co. Ltd. or “EVAL” from Kuraray Co., Ltd. Various grades of EVOH with ethylene copolymerization ratio of about 25-50% by mole can be used in the present invention. As for initiating polymerization, a photopolymerization method may be used to initiate polymerization by UV or visible light irradiation in the presence of photopolymerization initiators in a monomer mixture, or a radical polymerization method to thermally polymerize using azo compounds or organic peroxides. Examples of photopolymerization initiators comprise, without limitation, benzoin ethyl ether, benzyl dimethyl ketal, alpha, alpha′- diethoxy acetophenone, 2,4,6-trimethylbenzoyl diphenyl phosphine axide, and the like and mixtures thereof. Examples of organic peroxide comprise, without limitation, benzoin peroxide, t-butyl peroxide and the like and mixtures thereof. Examples of azo compounds comprise, without limitation, azobisisobutyronitorile, azobisdimethylvaleronitorile and the like and mixtures thereof. Among them, a photopolymerization method is very useful due to providing a stable polymerization in a short cycle time. The surface of the molded lens may be modified, if desired, by applying plasma treatment, ozone treatment, corona discharge, graft polymerization or the like. However, in a preferred embodiment, the present contact lenses have highly advantageous combinations of properties without requiring any surface treatment or modification. Dk value was determined by the so-called Mocon Method, for example using a test instrument commercially available under the model designation of Mocon Ox-Tran System. This method is described in Tuomela et al U.S. Pat. No. 5,817,924, the disclosure of which is hereby incorporated in its entirety herein by reference. The Dk value is expressed as barrers or 10−10 (ml O2 mm)/(cm2 sec mm Hg). Test pieces of about 3 mm width were cut out from a central part of lens and tensile modulus (unit; MPa or 107 dyne/cm2) was determined from an initial slope of a stress-strain curve obtained by tensile test at the rate of 100 mm/min in physiological saline solution at 25° C., using Autograph (Model AGS-50B manufactured by Shimadzu Corp.). The ionoflux of a contact lens or lens body is measured using a technique substantially similar to the so-called “Ionoflux Technique” described in Nicolson et al U.S. Pat. No. 5,849,811, the disclosure of which is hereby incorporated in its entirety herein by reference. The elongation of a contact lens or lens body is measured in the fully hydrated state. This measurement is conducted in a substantially conventional/standard way and involves pulling the specimen employing an Instron Machine. Other mechanical properties such as tensile strength, tear strength, and the like, were measured using well known and standardized testing techniques. A mixture of 150 gms of octamethylcyclotetrasiloxane, 22.6 gms of 1,3,5-trimethyltrifluoropropyl-cyclotrisiloxane, 5.2 gms of 1,3,5,7-tetramethyl-cyclotetrasiloxane, 9.8 gms of 1,3-bis(3-(2-hydroxyethoxy)propyl)tetramethyldisiloxane, 200 gms of chloroform and 1.5 gms of trifluoromethane sulfonic acid was stirred for 24 hours at 25° C., then washed repeatedly with purified water until a pH of the mixture became neutral. After water was separated, chloroform was distilled off under the reduced pressure. The residual liquid was dissolved in acetone (36 gms), reprecipitated with methanol (180 gms), followed by removal of volatile components under vacuum from a separated liquid to give a transparent viscous liquid. The said liquid was the siloxanediol having hydrosilane groups expressed by the following formula (H3R) with a yield of 125 gms. Here, although the structural formula of the linking group Y is shown as a block structure composed of each siloxane unit, actually it contains random structures, and this formula shows only a ratio of each siloxane unit. This is true throughout the Synthesis Examples. This material, identified as M3-U, has a number average molecular weight of about 15,000. This material, identified as M3-UU, has a number average molecular weight of about 20,000. A mixture of 50 gms of alpha-butyl-omega-[3-(2′ hydroxyethoxy)propyl)polydimethylsiloxane, 10 gms of methacryloyloxyethyl isocyanate, 150 gms of dry n-hexane and 0.2 gms of dibutyltin dilaurate was poured in a brown-colored flask and heated for 2 hours under reflux, then further stirred after an addition of 6 gms of methanol. Subsequently, n-hexane was distilled off under reduced pressure, and the resulting liquid was washed several times with methanol (30 gms)/water (15 gms) followed by removal of volatile components under vacuum to give a transparent viscous liquid with a yield of 54 gms. 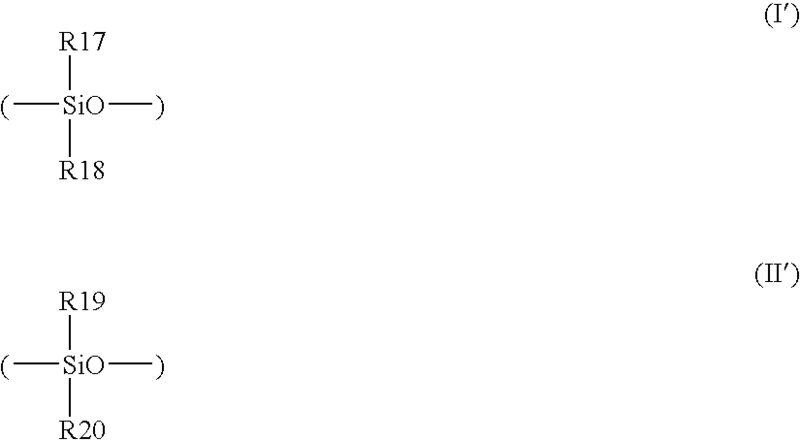 The liquid was the polysiloxane-methacrylate (FMM) expressed by the following formula. This material, identified as FMM, has a number average molecular weight of about 1500. A mixture of 64 parts by weight of M3-U the polysiloxane described in the Synthesis Example 1A, 10 parts by weight of N-vinyl-2-pyrrolidone (hereinafter NVP), 10 parts by weight of N-vinyl-N-methylacetamide (hereinafter “VMA”), 6 parts by weight of isobornyl methacrylate (hereinafter “IBM”), 10 parts by weight of methyl methacrylate (hereinafter “MMA”), 0.1 parts by weight of triallyl isocyanurate (hereinafter “TAIC”), and 0.1 parts by weight of 2,4,6-trimethylbenzoyl-diphenylphosphine oxide (hereinafter “TPO”), which was added last to the mixture, was mixed with stirring. The mixture was injected into a mold for forming a contact lens made of an ethylene vinyl alcohol resin (hereinafter “EVOH resin”) (made by The Japan Synthetic Chem. Ind. Co., Ltd., Soarlite S), then irradiated by ultraviolet (UV) light for 1 hour in a light exposure equipment to give a lens-shaped polymer. The lens thus obtained was soaked in ethyl alcohol for 1.5 hours, then soaked in fresh ethyl alcohol for an additional 1.5 hours, than soaked in an ethyl alcohol/water (1/1) mixture for 0.5 hours, soaked in deionized water for 3 hours, and then placed in PBS solution, and followed by autoclaving for 20 mins. The lens thus obtained was transparent and flexible, and showed good water wettability. Evaluation of physical properties showed results set forth in Table 1. Example 3 was repeated three times except that the mixtures formed had the compositions shown in Table 1. Each of the lenses thus obtained was transparent and flexible, and showed good water wettability. Evaluation of physical properties showed results set forth in Table 1. Example 3 was repeated four additional times except that the mixture formed had the components and compositions shown in Table 1. In each of these examples, 10 parts by weight of FMM was included. Thus, each of the mixtures comprise one silicon-containing macromer having a molecular weight of about 15,000, and another silicon-containing macromer having a molecular weight of about 1,400. Each of the lenses thus obtained was transparent and flexible, and showed good water wettability. Evaluation of physical properties showed results set forth in Table 1. A lens was prepared in accordance with Example 5. The hydrated lens was placed into a 2% by weight aqueous solution of glycerol monomethacrylate (GMMA)/glycerol dimethacrylate (GDMA) (97/3 by weight). The solution, with the lens included, was degassed and purged with nitrogen for 15 minutes. The aqueous solution was gently agitated to maintain hydration. The solution was heated to 70° C. for 40 minutes. An aqueous solution of 2,2′-azobis(2-amidinopropane dihydrochloride (Vazo 56) was added to the lens/solution. Polymerization was allowed to occur for 30 minutes. The lens was removed and repeatedly rinsed/soaked with deionized water. The lens thus obtained was transparent and flexible, and showed good water wettability. Evaluation of physical properties showed results set forth in Table 1. Two commercially available extended wear contact lenses were chosen for property testing. Evaluation of physical properties of these two lenses showed results set forth in Table 1. The present contact lenses, that is the contact lenses of Examples 3 through 11, have unique and advantageous combinations of physical properties which make each of such lenses highly effective in continuous or extended wear applications, particularly when considered in comparison to the comparative commercially available lenses of Examples 12 and 13. Each of the lenses produced in Examples 3 to 11, after appropriate processing to remove extractable material and to hydrate the lens in preparation for wear in a human eye, is placed in a human eye and worn for six (6) hours. After this period of time, the lens is removed and the eye is tested for corneal staining. Each of these lenses resulted in less than about 20% corneal staining. Each of the lenses in Examples 3 to 11 has a combination of properties, for example, including water content, oxygen permeability, modulus and/or one or more other mechanical-related properties, and ionoflux, which provides for enhanced performance, for example, in terms of lens function effectiveness, wearer comfort and safety, in continuous wear applications. The combinations of physical properties of the lenses of Examples 3 to 11 are unmatched, for example, by the competitive lenses of Examples 12 and 13. The lenses of Examples 3 to 11 are ophthalmically compatible during continuous wear for at least about 5 days or about 10 days or about 20 days or about 30 days. For example, such lenses do not adhere to the cornea during such continuous wear. In short, the present contact lenses of Examples 3 to 11 illustrate the substantial continuous wear advantages of embodiments of the present invention. In view of the disclosure herein, it can be appreciated that the present contact lenses comprise one or more features that are different than existing silicone hydrogel contact lenses. In one embodiment of the present lenses, the lens body has a water content of about 50% (such as 47% or about 48%) and a ionoflux between about 4 and about 5. In additional embodiments, such a lens body has a Dk greater than 100. The disclosure of U.S. Pat. No. 6,867,245 is hereby incorporated in its entirety herein by reference. A number of publications, patents, and patent applications have been cited hereinabove. Each of the cited publications, patents, and patent applications are hereby incorporated by reference in their entireties. 1. A silicone hydrogel contact lens, comprising a non-surface treated lens body comprising a hydrophilic, silicon-containing polymeric material, the lens body having at least one of an oxygen permeability, a water content, a surface wettability, a modulus, and a design effective in facilitating ophthalmically compatible wearing of the contact lens by a lens wearer at least for one day. 2. The contact lens of claim 1, wherein the lens body has an oxygen permeability, a water content, a surface wettability, a modulus, and a design effective in facilitating ophthalmically compatible wearing of the contact lens by the lens wearer at least for one day. 3. The contact lens of claim 1, wherein the lens body has an oxygen permeability, a water content, a surface wettability, a modulus, and a design effective in facilitating ophthalmically compatible wearing of the contact lens by the lens wearer for about thirty days. 4. The contact lens of claim 1, wherein the polymeric material comprises units from one silicon-containing macromer. 5. The contact lens of claim 1, wherein the polymeric material comprises units from two different silicon-containing macromers, each macromer having a different molecular weight. 6. The contact lens of claim 1, wherein the lens body has an oxygen permeability of at least about 70 barrers, a water content of at least about 30% by weight, a modulus less than about 1.4 mPa, and a contact angle on a surface of the lens body less than about 60 degrees. 7. The contact lens of claim 6, wherein the lens body has an oxygen permeability greater than about 110 barrers. 8. The contact lens of claim 6, wherein the lens body has a water content greater than about 45% by weight. 9. The contact lens of claim 6, wherein the lens body has a modulus less than about 0.9 mPa. 10. The contact lens of claim 6, wherein the lens body has an oxygen permeability of at least about 115 barrers, a water content of about 48% by weight, and a modulus of about 0.84 mPa. 11. The contact lens of claim 6, wherein the lens body has an oxygen permeability from about 70 barrers to about 100 barrers, a water content of at least about 50% by weight, and a modulus from about 0.3 mPa to about 0.5 mPa. 12. A contact lens comprising a lens body comprising a hydrophilic, silicon-containing polymeric material, the lens body having a Dk of greater than about 110 barrers and an equilibrium water content of greater than about 30% by weight, the contact lens being ophthalmically compatible. 13. The contact lens of claim 1 wherein the lens body has a Dk of at least about 150 barrers. 14. The contact lens of claim 12, wherein the lens body has an equilibrium water content of at least about 35% by weight. 15. The contact lens of claim 12, wherein the lens body has an anterior surface and a posterior surface, and at least one of the anterior and posterior surfaces is not modified. 16. The contact lens of claim 15, wherein both the anterior and posterior surfaces are not modified. 17. The contact lens of claim 12, wherein the lens body has a modulus of about 1.4 mPa or less. 18. The contact lens of claim 12, wherein the lens body has an elongation of at least about 90%. 19. The contact lens of claim 12, wherein the lens body has an ionoflux of no greater than about 5 10−3 mm2/min. 20. The contact lens of claim 12, wherein the polymeric material comprises units from one silicon-containing macromer. 21. The contact lens of claim 12, wherein the polymeric material comprises units from two silicon-containing macromers having different molecular weights. 22. The contact lens of claim 21, wherein units from a high molecular weight silicon-containing macromer are present in a greater amount by weight in the polymeric material than units from a low molecular weight silicon-containing macromer. 23. The contact lens of claim 21, wherein the polymeric material comprises units from a silicon-containing macromer having a number average molecular weight of at least about 10,000. 24. The contact lens of claim 21 wherein the two silicon-containing macromers have number average molecular weights which differ by at least about 5,000. 25. The contact lens of claim 22, wherein units from the high molecular weight silicon-containing macromer are at least about 40% by weight of the polymeric material. 26. The contact lens of claim 22, wherein units from the high molecular weight silicon-containing macromer and from the low molecular weight silicon-containing macromer total at least about 50% by weight of the polymeric material. 27. The contact lens of claim 21, wherein one of the silicon-containing macromers is mono-functional. 28. The contact lens of claim 21, wherein the polymeric material comprise units from a plurality of hydrophilic monomers. 29. A contact lens comprising a lens body comprising a hydrophilic, silicon-containing polymeric material, the lens body having a Dk of greater than about 70 barrers and an equilibrium water content of greater than about 30% by weight, the lens body being produced without surface treatment, the contact lens being ophthalmically compatible. 30. The contact lens of claim 29, wherein the lens body has a Dk of at least about 90 barrers. 31. The contact lens of claim 29, wherein the lens body has an equilibrium water content of at least about 35% by weight. 32. The contact lens of claim 29, wherein the lens body has a modulus of about 1.4 mPa or less. 33. The contact lens of claim 29, wherein the lens body has an elongation of at least about 90%. 34. The contact lens of claim 29, wherein the lens body has an ionoflux of no greater than about 5 10−3 mm2/min. 35. The contact lens of claim 29, wherein the polymeric material comprises units from one silicon-containing macromer. 36. The contact lens of claim 29, wherein the polymeric material comprise units from two silicon-containing macromers having different molecular weights. 37. The contact lens of claim 36, wherein the polymeric material comprises units from a plurality of hydrophilic monomers. 38. A contact lens comprising a lens body comprising a hydrophilic, silicon-containing polymeric material, the lens body having a Dk of greater than 100 barrers, an equilibrium water content of greater than about 30% by weight, and an ionoflux no greater than about 5 10−3 mm2/min, the contact lens being ophthalmically compatible. 39. The contact lens of claim 38, wherein the lens body has a Dk of at least about 130 barrers. 40. The contact lens of claim 38, wherein the lens body has an equilibrium water content of at least about 35% by weight. 41. The contact lens of claim 38, wherein the lens body has an anterior surface and a posterior surface, and at least one of the anterior and posterior surfaces is not treated. 42. The contact lens of claim 41, wherein both the anterior and posterior surfaces are not treated. 43. The contact lens of claim 38, wherein the lens body has a modulus of about 1.4 mPa or less. 44. The contact lens of claim 38, wherein the polymeric material comprise units from two silicon-containing macromers having different molecular weights. 45. The contact lens of claim 38, wherein the polymeric material comprises units from a plurality of hydrophilic monomers. 46. A contact lens comprising a lens body comprising a hydrophilic, silicon-containing polymeric material, the lens body having an equilibrium water content of greater than about 15% by weight, the polymeric material comprises units from two silicon-containing macromers having different molecular weights, the lens body being ophthalmically compatible. 47. The contact lens of claim 46, wherein one of the macromers has a number average molecular weight greater than about 10,000. 48. The contact lens of claim 46, wherein the polymeric material comprises units from a plurality of hydrophilic monomers. 49. The contact lens of claim 46, wherein the lens body has a Dk of at least about 70 barrers. 50. The contact lens of claim 46, wherein the lens body has an equilibrium water content of at least about 30% by weight. 51. The contact lens of claim 46, wherein the lens body has an anterior surface and a posterior surface, and at least one of the anterior and posterior surfaces is not treated. 52. The contact lens of claim 46, wherein the lens body comprises no surface treatment. 53. The contact lens of claim 46, wherein the lens body has a modulus of about 1.4 mPa or less. 54. The contact lens of claim 46, wherein the lens body has an ionoflux of no greater than about 5 10−3 mm2/min. 55. The contact lens of claim 46, wherein the lens body has an elongation of at least about 90%. MX2008001763A (en) 2005-08-09 2008-04-07 Coopervision Inc Compositions and methods for producing silicone hydrogel contact lenses. DE68900132D1 (en) 1988-02-26 1991-08-08 Ciba Geigy Ag Wettable, flexible, sauerstoffdurchlaessge contact lens consisting of block copolymers with polysiloxane-polyoxyalkylene divided in the main chain. ES2022761B3 (en) 1988-02-26 1991-12-01 Ciba-Geigy Ag Wettable lenses, flexible, oxygen permeable contact, support units containing polyoxyalkylene block copolymer polysiloxane, and usage.